Based on 6191 customer ratings. You’ll remember every bite you take at Giordano’s. Stop by our dining room and enjoy full bar service, or schedule a party in our private room. You can also order delivery or pickup to your Central Loop-area office or home! What better way to top off a day shopping on State Street or a visit to the Chicago Board of Trade than with a visit to the best deep dish pizza place in town? 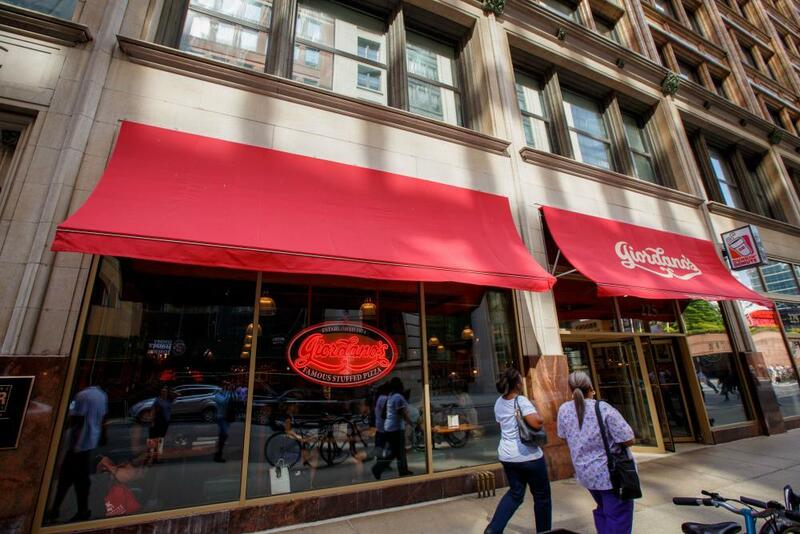 For over 40 years, Giordano’s has been more than a restaurant — we’re a cherished Chicago experience. Isn’t it time you created a new pizza tradition? Giordano’s Is the Best Pizza Place in Town Regular pizza has crust and cheese and toppings, but it can’t compare to the handcrafted, flaky, stuffed pizza goodness that’s in every pie at Giordano’s. Every Giordano’s pizza kitchen employs 6 trained artisans who build each pizza to your specifications — and slow bake it to perfection. You’ll love our fluffy Wisconsin mozzarella and our flavorful, fresh toppings. Take one bite and you’ll see why we’re the best pizza delivery and restaurant in town! Getting ready for an evening out at the Opera House or the theater district, and pizza won’t do the trick? Try our mouthwatering pastas, specialty Italian sandwiches, crisp salads and savory appetizers. We have gluten-free options, too. At Giordano’s, there’s something for everyone! Plan your next event at the SkyDeck with Giordano’s. Enjoy world famous Chicago style pizza at Willis Tower VIP Style, 99 floors up! Make it a special date for two or bring the whole family for an unforgettable experience. Spectacular views of up to four states. Contact the Skydeck Sales Office at sales@theskydeck.com or call 312.875.9447.